When Stephanie was on the table in Dr. Brian Van Adel’s operating room, two lives were at stake. 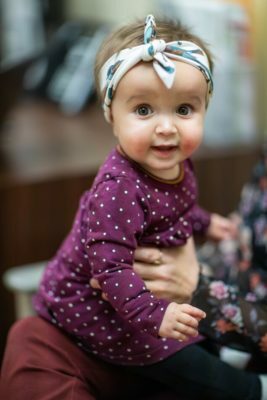 She was six months along with a baby girl, and was about to become the first patient at Hamilton Health Sciences (HHS) to have a clot retrieval procedure while pregnant. Not just the first in Hamilton, but one of the first in the world. It was about 10:30 at night when Stephanie began to experience stroke symptoms as she got ready for bed. Her speech began to slur, and she drooled while brushing her teeth. The left side of her body became weak. The 35-year old didn’t know the signs of stroke, and brushed the symptoms off. Her partner, Reza, suggested they call 9-1-1, but she protested. He insisted, and they asked a neighbour to look after their 4-year old daughter while they waited for the ambulance. Paramedics immediately identified her stroke symptoms and called ahead to HGH, the regional stroke care provider for Hamilton and Niagara North West. This ensured the stroke team was ready when Stephanie arrived in the emergency department. Dr. Van Adel says that quick thinking made a big difference. When someone is suffering a stroke, millions of brain cells die each minute, so every second counts. Stephanie was met in the emergency department by Dr. Van Adel along with Dr. Kelvin Ng. They agreed she was experiencing a stroke, likely as a result of a clot in her brain. Scans confirmed it. In most cases like Stephanie’s doctors use a special drug which dissolves the clot causing the stroke. However, the drug comes with a risk of excessive bleeding, which could be difficult to manage in a pregnant woman. The team decided Endovascular Therapy, more commonly known as EVT or clot retrieval, was Stephanie’s best option, although they had never performed it on someone having a stroke while pregnant before. The procedure involves inserting a tiny scope through an artery in the patient’s leg, and snaking it up to their brain. Then, they extract the clot with help from x-ray technology. It’s still a relatively novel treatment, and had only been performed on a handful of pregnant women in the world. But it was their best shot. Drs. Ng and Van Adel consulted with obstetrics at Hamilton Health Sciences’ McMaster University Medical Centre (MUMC) and they agreed the baby wouldn’t be at risk during the procedure. Clot retrieval surgery requires the patient to lie very still while the scope is snaked through their artery and into their brain. Stephanie recalls being incredibly uncomfortable lying on her back. The dye used to illuminate her arteries was putting pressure on her eyes and she was in pain. “It was really intense,” she recalls. “But I still don’t think the seriousness of my situation had sunk in at that point.” Dr. Ng checked the baby’s heartbeat before and after the procedure, and an ICU doctor was on hand in case anything went wrong. Dr. Van Adel successfully retrieved the clot from Stephanie’s brain. It was about the size of a grain of rice, and had been blocking blood flow to important parts of her brain. Because the team was able to retrieve it so quickly, Stephanie made a complete recovery. Three months after the clot retrieval procedure, Stephanie delivered healthy baby Iris at MUMC. Stephanie sees the team at HGH for regular checkups, and is doing very well. 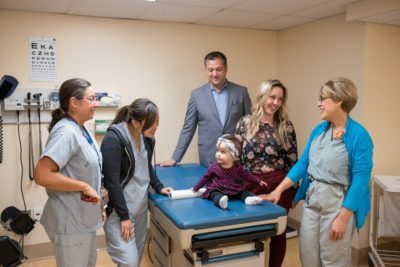 When she first brought the bright-eyed little girl in to meet the team who saved her life, there were few dry eyes in the room. If you suspect someone is having a stroke, call 9-1-1 immediately. Learn more about the signs of stroke in this short video. Subscribe to our newsletter for weekly stories, photos and expert health advice.